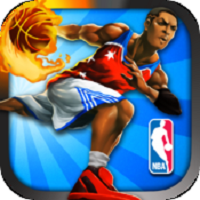 NBA Rush from RenRen Games provides a different look and feel for the endless runner genre. This time around Earth is under threat of an alien invasion and it is up to your favorite NBA players to save mankind. What all this means is you have to doge, jump, run and dunk on the aliens. It sounds like a lot of fun and it is. NBA Rush is an endless runner but has added several elements that make it more exciting than the average run of the mill ones. The controls stay similar to those in other games, so you won’t have problems going around the city. Just swipe left or right to change directions while swiping up or down will help you get past obstacles and roadblocks like road signs, buses and being attacked by some really cool looking UFOs. But you’re not entirely helpless here since you can collect power ups, allowing them to jump higher and go after UFOs. The graphics and sound is first rate and you’ll always get the urge to do another round, indicative of how addictive NBA Rush really is. Aside from the sheer joy of going after those aliens, you can unlock other NBA players and characters, adding extra appeal to the game. There may be a lot of endless runners on the iOS, but NBA Rush deserves a place on your device for being an addictive game. It breathes fresh air into the genre, and if you love basketball and endless runners, then NBA Rush is something you’ll like.